The Agricultural Conservation Planning Framework (ACPF) leverages high-resolution geo-spatial data to help local farming communities better address their soil and water conservation needs. 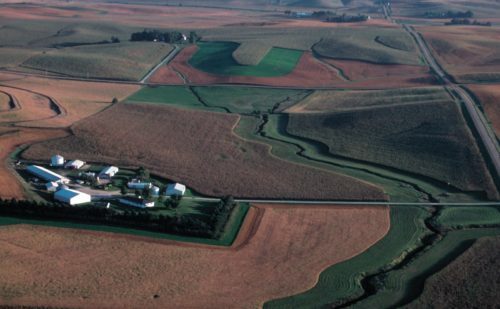 The USDA National Agricultural Statistics Service (NASS) has released the 2018 Cropland Data Layer . This data is used in the ACPF to populate the crop history table (CH) and the land use table (LU6). In order to use this updated data, the ACPF Utility Get NASS CDL by Year tool and the crop history and land use tables need to be modified. Check out this video to update your watersheds database! The ACPF is being used in hundreds of watersheds in states across the Corn Belt to inform and engage local producers in agricultural conservation. ACPF input data is available for much of the Midwest and the database is constantly growing. Currently, ACPF data is available for Illinois, Iowa, Minnesota, and Wisconsin and parts of Indiana, Kansas, Missouri, Nebraska, North Dakota and South Dakota. Plus, with ACPF Version 3, users are able to build soils and land use databases where not available! Find out if ACPF input data is available for your watershed. Curious for more examples of where ACPF is being used? Explore the ACPF use map displaying watersheds that have reported using ACPF. If you are already using ACPF, let us know and we’ll ensure your watershed is included! Submit your watershed to our ACPF in Action map using this form. Know of multiple watersheds? Get in touch with us. The ACPF is being used by a diversity of stakeholders and in a variety of different situations. No matter the local context, ACPF can help you reach your goals. The ACPF identifies and addresses high-risk areas enabling conservation efficiency and effectiveness. The ACPF identifies high-risk areas and determines solutions that can serve as the foundation for watershed plans. The output maps generated through ACPF show the watershed as a whole, simplifying area-wide planning. The ACPF takes the guesswork out of talking to producers and installing conservation practices and streamlines conservation planning. The ACPF is non-prescriptive, allowing landowners and local stakeholders to choose the option that is right for their land, their community, and their watershed. The ACPF facilitates conversation between diverse stakeholders with different perspectives, issues and priorities. The ACPF output maps can be used in conversations with producers, drainage authorities, county supervisors, and program managers, to name a few. The ACPF output maps help conservation professionals scientifically justify recommendations and proposals to producers and funders. With ACPF, grant applicants can prioritize and develop potential projects for funding based on outputs. Copyright ©2019 North Central Region Water Network. The ACPF concept originated under a USDA-Natural Resources Conservation Service (NRCS) Conservation Innovation Grant awarded to the Environmental Defense Fund in 2011. Subsequent support through interagency agreements between ARS and NRCS have been facilitated through the Central National Technology Center, and the Conservation Effects Assessment Project. This website was developed under Cooperative Agreement No. 83675501 awarded by the U.S. Environmental Protection Agency. It has not been formally reviewed by EPA. The views expressed in this document are solely those of the University of Minnesota Water Resources Center and EPA does not endorse any products or commercial services mentioned in this publication.